How to secure key accounts from scratch? We’ve all been there: we’re launching our product, we need cash, we need to make a name for ourselves, build an image and gain legitimacy. And we need to do it fast. One way to achieve this is by landing a key account. 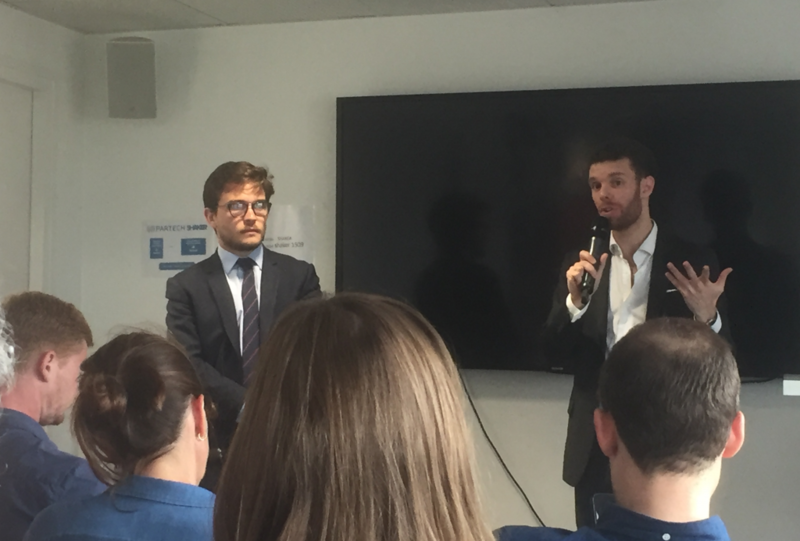 Jean Tuloup and Mathias Garcia Reinoso, former financial auditors who created their own corporate communications and management training company (JMDevelopment) less than a year ago, gave the audience the 9 crucial steps to win the trust of key accounts and convince them to buy your product. - Appearances are key for large groups! Make sure that you adopt not only their dress codes, but also for presentation of documents, invoices, contracts, etc. - Be sure that you have identified and respected the group’s procedures, which are more segmented and structured than in a start-up organization. Based on their personal experience - they’re already working with big players such as Unibail-Rodamco, Polytechnique, EY, Mazars or NUMA – Jean and Mathias have identified 9 essential steps to secure a contract with a key account. You really need to understand what type of company interests you. Is it a group with an activity that compliments yours? Or shares your values? A competitor? Efficient target identification will help you to speed up the process. This is the time to activate your network and ask your contacts to help you identify the people who can help you. - Attend events such as trade shows to identify potential targets. But remember, to ensure that you stand out from your competition, this step needs to be prepared carefully. Be sure that your first contact with your target goes well, whether it be face-to-face, on the telephone or by email. You will have 10 seconds to capture your contact’s attention. Be as sincere and relevant as possible. In an email, capturing your contact’s attention from the very first sentence is crucial: it needs to be sufficiently impactful and differentiating. Jean tells us about his meeting with the Managing Director of BPI at a conference: he caught her attention by telling her how much one of her sentences during her speech was relevant to his own project. This is not a meeting with the person who will be signing your contract, but with a person in a key position who will be able to put you in contact with the person who will accept to test your offer. For JM Management, this would be a contact who knows the head of training, for example. You need to be clear, brief and frank with this target. Don’t waste their precious time. Once you have identified this decision-maker, your goal is to secure a product-test meeting (face-to-face if possible) with him/her. Often with key accounts, the best approach is proof by example: conduct a conclusive test to convince them to implement your offer on a large scale. You will need a simple and inexpensive proposal that can be rolled out easily, one that doesn’t require approval from a number of key people in the company. Your product/offer has been tested, now you need to secure a meeting to assess the test and get your prospect’s feedback. If the test is positive, it will be easier to convert it into a contract! - Never offer to do a free test! In fact, the guarantee of your credibility is the quality of your price list. - Plan the next steps for payment quickly, as payment periods can be lengthy in large companies. Don’t hesitate to tell them that you need cash. Carefully prepare this step, which consists of sending all the documents necessary for the contract signature. The negotiation process for a frame agreement can be very long. Don’t hesitate to follow-up with the customer. In SBF 120 companies, the signature of a framework agreement can be very time-consuming! With key accounts, the most important thing is to build and nurture the relationship of trust that you have created with them. - Get to know their internal network well: this will enable you to remain visible in the relationship. You never know when your key contact may leave the company: if your contact takes maternity leave, you need to know who to deal with in their absence. You need to take your customer relationship to the next level: your contacts are your allies! How should we handle the relationship with the purchasing department, who often show bad faith to delay invoice payment? We are rarely in contact with the purchasing department. Your key contacts are your contract signatories: they have the power to press the button to trigger your invoice payment. How should referencing problems with the purchasing department be managed? In CAC 40 companies, the purchasing department is not the decision-maker. The people who can get you referenced quickly are those who are trusted by the members of the Management Committee. But remember to comply fully with your customer’s invoice rules: be meticulous when drafting your invoice (purchase order number, correct address, contact name…). Supplier referencing is a lengthy process, so don’t hesitate to begin it as early as possible, don’t wait until the last minute as it can take months. How should we manage service costing? Our price strategy is the benchmark. We are lucky because we know our competitors well. Reference documents are a good source of information: in our industry, they provide us with key indicators such as the price of a training program per person and per day. When we get to the budget negotiation stage, we always judge the customer’s reaction (look of shock, head shaking, lack of reaction) when we announce our prices and then adapt accordingly!